The field of population genetics examines the amount of genetic variation within populations and the processes that influence this variation. A population is defined as a group of interbreeding individuals that exist together at the same time. Genetic variation refers to the degree of difference found among individuals, for instance in height, coat color, or other less observable traits. The particular set of genes carried by an individual is known as his or her genotype, while all the genes in a population together comprise the "gene pool." The foundation for population genetics was laid in 1908, when Godfrey Hardy and Wilhelm Weinberg independently published what is now known as the Hardy-Weinberg equilibrium. The "equilibrium" is a simple prediction of genotype frequencies in any given generation, and the observation that the genotype frequencies are expected to remain constant from generation to generation as long as several simple assumptions are met. This description of stasis provides a counterpoint to studies of how populations change over time. The 1920s and 1930s witnessed the real development of population genetics, with important contributions by Ronald Fisher, Sewall Wright, and John B. S. Haldane. They, with many others, clearly established the basic processes which caused populations to change over time: selection, genetic drift, migration, and mutation. The change in the genetic makeup of a population over time, usually measured in terms of allele frequencies, is equivalent to evolutionary change. For this reason, population genetics provides the groundwork for scientists' understanding of evolution, in particular microevolution, or changes within one or several populations over a limited time span. The questions addressed by population genetics are quite varied, but many fall within several broad categories. How much genetic variation is found in populations, and what processes govern this? How will a population change over time, and can a stable endpoint be determined? How much and why do populations of the same species differ? The answer is always cast in terms of selection, drift, mutation, migration, and the complex interplay among them. Of the four, selection and genetic drift are usually given credit as the major forces. Simply put, selection occurs when some genotypes in the population are on average more successful in reproduction. These genotypes may survive better, produce more offspring, or be more successful in attracting mates; the alleles responsible for these traits are then passed on to offspring. There is broad theoretical consensus and abundant empirical data to suggest that selection can change populations radically and quickly. If one genetic variant, or allele, increases survivorship or fertility, selection will increase the frequency of the favored allele, and concurrently eliminate other alleles. This type of selection, called directional selection, decreases the amount of genetic variation in populations. Alternatively, an individual carrying two different alleles for the same gene (a heterozygote) may have advantages, as exemplified by the well-known example of the sickle-cell allele in Africa, in which heterozygotes are more resistant to malaria. In this case, called overdominant selection, genetic variation is preserved in the population. Although a number of similar examples are known, directional selection is much more common than overdominant selection; this implies that the common action of selection is to decrease genetic variation within populations. It is equally clear that if different (initally similar) populations occupy different habitats, selection can create differences among populations by favoring different alleles in different areas. Cheetahs, which have very little genetic variation, are presumed to have gone through several genetic bottlenecks. changes in allele frequency. In sexual species, the frequency of alleles contained in the progeny may not perfectly match the frequency of the alleles contained in the parents. As an analogy, consider flipping a coin twenty times. Although one might expect ten heads and ten tails, the actual outcome may be slightly different; in this example, the outcome (progeny) does not perfectly represent the relative frequency of heads and tails (the parents). What does this mean for populations? Start by considering neutral alleles, which have no impact on survival or reproduction. (An example is the presence or absence of a widow's peak hairline.) The frequency of a neutral allele may shift slightly between generations, sometimes increasing and sometimes decreasing. What outcomes are expected from this process? Suppose that a particular allele shifts frequency at random for a number of generations, eventually becoming very rare, with perhaps only one copy in the population. If the individual carrying this allele does not pass it on to any offspring or fails to have any offspring, the allele will be lost to the population. Once lost, the allele is gone from the population forever. In this light, drift causes the loss of genetic variation over time. All populations are subject to this process, with smaller populations more strongly affected than larger ones. Perhaps better known than the pervasive, general effects of genetic drift are special examples of drift associated with unusually small populations. Genetic bottlenecks occur when a small number of individuals from a much larger population are the sole contributors to future generations; this occurs when a catastrophe kills most of the population, or when a few individuals start a new population in different area. Genetic bottlenecks reduce the genetic variation in the new or subsequent population relative to the old. 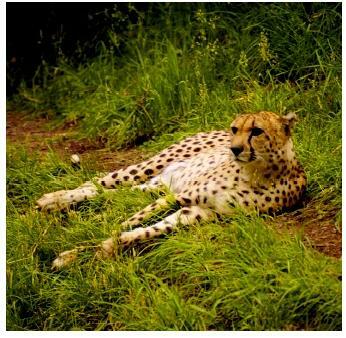 Cheetahs, which have very little genetic variation, are presumed to have gone through several genetic bottlenecks. Occasionally, these new populations may have particular alleles that are much more common than in the original population, by chance alone. This is usually called the founder effect. Migration may also be important in shaping the genetic variation within populations and the differences among them. To geneticists, the word "migration" is synonymous with the term "gene flow." Immigration may change allele frequencies within a population if the immigrants differ genetically. The general effect of gene flow among populations is to make all of the populations of a species more similar. It can also restore alleles lost through genetic drift, or introduce new alleles formed by mutation in another population. Migration is often seen as the "glue" that binds the subpopulation of a species together. Emigration is not expected to change populations unless the migrants are genetically different from those that remain; this is rarely observed, so emigration is often ignored. The last important process is mutation. Mutation is now understood in great detail at the molecular level, and consists of any change in the deoxyribonucleic acid (DNA) sequence of an organism. These mutations range from single base substitutions to the deletion or addition of tens or hundreds of bases to the duplication or reorganization of entire chromosomes . Mutation is most important as the sole source of all new genetic variation, which can then be spread from the population of origin by migration. This importance should not be undervalued, although the impact of mutation on most populations is negligible at any given time. This is because mutation rates are typically very low. The real challenge of population genetics has been in understanding how the four processes work together to produce the observable patterns. For instance, genetic drift eliminates variation from populations, as do the most common modes of natural selection. How then can the abundance of genetic variation in the world be explained? This question has many complicated answers, but some cases, such as the observation of deleterious alleles in humans (for example, alleles for phenylketonuria, a genetic disease), might be explained in terms of mutation and selection. Mutation adds these alleles to a population, and selection removes them; although the rate of mutation is likely to be nearly constant, the rate at which selection removes them increases as the abundance of the allele increases. This is certainly true for recessive alleles, which are only expressed when an individual has two copies. With only one, the allele remains unexpressed and therefore not selected. At some point, predictable from the mutation rate and physical consequences of the disease, the two opposing forces balance, producing the stable persistence of the disease allele at low frequency. As a discipline, population genetics has contributed greatly to scientists' understanding of many disparate topics, including the development of resistance of insects to insecticides and of pathogenic bacteria to antibiotics, an explanation of human genetic variation like the alleles for sickle-cell anemia and blood groups, the evolutionary relationships among species, and many others. Of particular interest is the use of genetic data in conservation biology. By definition, endangered and threatened species have reduced population sizes, making them subject to the vagaries of genetic drift and also to inbreeding. Inbreeding is mating between genetically related individuals, and often leads to inbreeding depression, a reduction of health, vigor, and fertility. Genetic drift leads to a loss of genetic variation, which limits what selection can do to produce adaptations if the environment changes. Keeping these two issues in mind, greatly reduced populations may be at increasingly greater risk for genetic reasons, leading to further declines. Hardy, Godfrey. "Mendelian Proportions in Mixed Populations." Science 28 (1908): 49–50. Hartl, Daniel. A Primer of Population Genetics. Sunderland, MA: Sinauer Associates, 1999. Hedrick, Philip W. Genetics of Populations. Boston, MA: Jones and Bartlett, 2000. Smith, John Maynard. Evolutionary Genetics, 2nd ed. Oxford, England: Oxford University Press, 1998. British biologist and author who immigrated to India. Haldane was famous for both his flamboyant personality and his influence on genetics and evolutionary biology. Haldane, along with Ronald Fisher, showed that evolution is the change in frequency of individual genes over time.